During one of our open days here at Paraiso del Burro which happen on the first Sunday of every month during the summer and every second month at all other times of the year, a Spanish couple came along to see the sanctuary and speak to Marleen about the possibility of having Lyka come and live here. Marleen had a conversation with them to see whether the place would suit Lyka. Lyka is over 20 years old and had been a working donkey of the parents of the woman. Her parents were unable to look after Lyka no more so the people took Lyka to live with them. Lyka had been with them for quite a while. Over time they felt that it would be more suitable to find Lyka new home as they could not look after her any more. Lyka was collected from a village on the way to Oviedo. Marleen, Mia and I went to collect lyka. We parked up and walked down the road to greet her. Lyka came walking up the road with her owner. She is a small donkey with a very black coat and some white markings on her face and neck. She is very beautiful and calm and as we walked her into the trailer she did so at great ease and comfort. 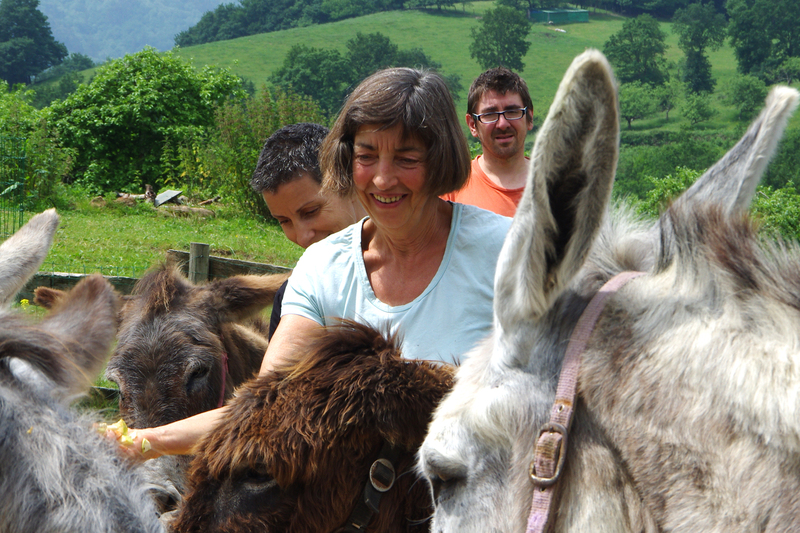 We returned to Paraiso del Burro and Lyka stayed in the small stable to begin with where Rosie and Hannah live. She remained with Rosie and Hannah for a few weeks and was slowly introduced to the rest of the donkeys here. The way in which this is done here is, during the day Lyka was walked out into the main field and spent some time there, and then she may return to the gate so she can come into the front garden again. This continued like that for a while and then when it came to feeding time in the evening Lyka was placed in sable 3 which holds 5 other donkeys, when she finished eating she returned to her original stable. Marleen felt that sufficient time had passed and Lyka seemed comfortable enough to be in stable 3 on a permanent basis. This has worked very well and Lyka appears to be adapting and making friends. She does like to spend a lot of time by herself but also is taking steps in her own time to integrate with the other donkeys. Although she has Arthritis in her front knee and her hooves are in a bad condition this is managed by the regular visits and checkups of our farrier called Mariano. Lyka likes to walk around and explore the place. She is a very affectionate donkey and when you spend time with her she likes to be close and is very curious of people and the affection she is given. Lyka really likes to be brushed and this is done here on a Monday by Lynn and on a Wednesday by Joanne and Samantha. When we collect the donkeys in the evening and Lyka is brought to stable 3 she goes straight away to her spot where she is given her bowl of food. From my experience of being here I have noticed how intelligent donkeys are as well as being affectionate, open hearted and sociable animals. When you spend time with Lyka all of these aspects are clear to see.